In the early morning hours of 13 August 1961, East German construction workers, soldiers, and police assembled to conduct a top-secret operation. The construction workers began ripping up streets in Berlin, with the intention of building a wall. This wall, which would extend 43 km through Berlin and 112 km around West Berlin, separated neighbourhoods and families, and would physically and ideologically divide Berlin, Germany, and the world. These early morning hours of 13 August 1961 marked the beginning of the Berlin Wall, one of the most notorious dividing lines in the history of the world. The Berlin wall extended 43 km through Berlin and 112 km through East Germany. The wall entirely enclosed the western districts of Berlin. Before we can understand the Berlin Wall itself, we have to understand why it existed in the first place, and to understand this, we have to go back to World War II. America, Britain, France, and the Soviet Union were allied against the Axis Powers, particularly Nazi Germany. After the allies’ defeat of Nazi Germany, each of the four powers occupied part of Germany. The American, British, and French sectors were in the west, whilst the Soviet sector was in the east. Following the end of the war, relations between the Western Powers (America, Britain, and France) and the Soviet Union deteriorated, as a result of their differing visions for post-war Europe. The Western Powers promoted liberal market economies, whilst the Soviet Union sought to surround itself with Communist satellite states, including Germany. The deterioration of relations reached a breaking point when the Federal Republic of Germany (FRG, West Germany) was declared in the west, occupying the American, British, and French sectors. The Soviets, meanwhile, declared the German Democratic Republic (GDR, East Germany), which was to occupy the former Soviet sector. Soviet satellites restricted movement between the Iron Curtain. As a result, the border became virtually impassable, thereby getting its name of the Iron Curtain. Before we delve into the complex history of the Berlin Wall, we have to address a common misconception first. The misconception is that Berlin lay on the border of East and West Germany, and the Berlin Wall refers to the section of the Inner German Border (the border between East and West Germany) inside Berlin. This is not true. The Inner German Border was entirely separate from the Berlin Wall. Berlin was located deep inside of East Germany – however, Berlin was divided up among Western Powers just like the entire nation of Germany was. The Inner German Border was virtually impassable, which meant that all Germans outside Berlin had virtually no hope of escape. Meanwhile, their counterparts in Berlin could just cross the street from East Germany into West. No border security, no walls, it was that simple. This situation arose because even though there was border security on the Inner German Border, there was no border security within Berlin to keep people from entering the democratic enclave in West Berlin. This serious loophole allowed up to 3.5 million people (20% of the GDR’s population) to escape to the West. This spurred the East German leadership to construct the Berlin wall. The construction of the initial barrier began in August 1961. By 1965, 106 km of 3.6 m high concrete barricades had been constructed, topped with a smooth pipe to prevent climbing. Over time, the Berlin Wall was strengthened with spike strips, guard dogs, and land mines, along with 302 watch towers and 20 bunkers. The wall also included a 100 m wide death strip – all buildings were demolished, and the ground was covered with sand to provide a clear line of sight for the border guards, who were ordered to shoot anyone attempting to cross. An example of the wall’s “Death strip” featuring Czech hedgehogs (anti-tank devices) and a guard tower. Even still, nearly 5,000 people managed to escape East Germany between 1961 and 1989. Some were diplomats or athletes who defected whilst abroad, yet others were ordinary people who dug tunnels, swam through canals, and flew hot air balloons. There was even an incident where someone crashed a stolen tank through the wall. Attempting to escape was extremely dangerous, with up to 138 people dying whilst doing so. The Eastern Bloc’s reasoning for the wall was so that its population could be protected from fascist elements conspiring to suppress the “will of the people” (the Eastern Bloc also propagated the idea that West Germany and West Berlin were a continuation of the Nazi regime). In actuality, the wall was constructed to prevent the mass emigration and defection to the west that we discussed earlier, where up to 3.5 million people left East Germany for the west. Even worse, most of the defectors were young and well educated, and this loss of talent to the west was dubbed the “brain drain” by Eastern Bloc officials. The wall stabilised East Germany’s economy be preventing people from leaving. However, it destroyed the country’s reputation, as the wall became known worldwide as a symbol of Communist repression. The communist system in Europe began to fall apart by the end of the 1980’s. The liberalisation of other Eastern Bloc states led to massive protests in East Germany demanding freedom of movement and democracy. 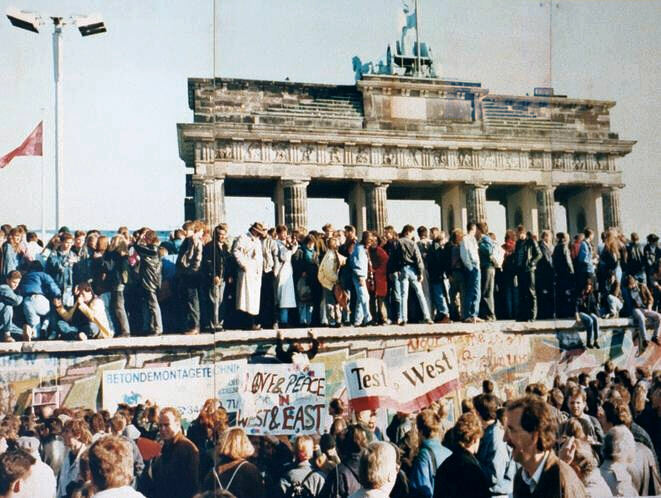 On the evening of 9 November 1989, the regime tried to diffuse tensions by making travel permits easier to obtain – but this announcement resulted in thousands of East Berliners at the Berlin Wall, overwhelming the border guards and forcing them to open the gates immediately. The iconic image of Berliners standing atop the Berlin Wall. Thousands of East Berliners poured into West Berlin, beginning to demolish the wall with whatever tools they could find. The border guards initially tried to maintain order, but by this point, it was obvious that German division was over. Germany was officially reunified in October 1990, and the Soviet Union fell soon after, in December 1991. Placard found in all roads between Western and Eastern Germany that were blocked during division. Text translated as: “Here, Germany and Europe were divided until 10 December 1989 at 10:15 am”. The date and time vary according to the actual moment when a particular crossing was opened.